There are 26 Assisted Living Facilities in the West Orange area, with 6 in West Orange and 20 nearby. The average cost of assisted living in West Orange is $3,750 per month. This is higher than the national median of $3,346. To help you with your search, browse the 200 reviews below for assisted living facilities in West Orange. On average, consumers rate assisted living in West Orange 3.9 out of 5 stars. Better rated regions include Bloomfield with an average rating of 4.9 out of 5 stars. Caring.com has helped 9 families in West Orange find high-quality senior care. To speak with one of our Family Advisors about assisted living options and costs in West Orange, call (855) 863-8283. West Orange is a suburban town in Essex County, New Jersey, in close proximity to beaches, ski resorts and Manhattan, New York. Nearly 17 percent of the West Orange population is 65 or older, and the area features ample accommodations for senior citizens. West Orange includes six assisted living facilities, and 51 more facilities are available in nearby areas, such as Fairfield and Newark. In New Jersey, the assisted living residences are typically apartment complexes with shared dining spaces for four or more people. Seniors in West Orange will find plenty of suitable weather for outdoor activities. The area gets about 205 sunny days per year and has fewer days of precipitation than the average U.S. city. Precipitation days do include more rain and snow than average. Temperatures reach an average high of 84 degrees Fahrenheit in summer and an average low of 20 degrees in winter. Bus and rail services are available via NJ Transit, which offers reduced fare to seniors 62 and older. Also, West Orange features a Senior Citizen Transportation Program, which offers curb-side transportation with advanced reservation. Essex County was graded F for ozone pollution and B for 24-hour particle pollution by the American Lung Association. Reduced air quality can be detrimental to seniors with respiratory illnesses. With a crime rate higher than that of 76 percent of other cities in New Jersey, West Orange is not one of the safer communities in the state. The odds of violent crime are slightly lower than the state average, but the odds of property crime are above average. West Orange has an array of community resources for seniors, including the Senior Gardening Program and Senior Citizens Recreation Services, which provide classes to seniors for Zumba, yoga and aerobics at the Social Services office. Many arts and cultural attractions await seniors in West Orange, such as live performances at Luna Stage, the Valley Arts district and the Thomas Edison National Historic Park. Assisted Living costs in West Orange start around $3,750 per month on average, while the nationwide average cost of assisted living is $4,000 per month, according to the latest figures from Genworth’s Cost of Care Survey. It’s important to note that assisted living rates in West Orange and the surrounding suburbs can vary widely based on factors such as location, the level of care needed, apartment size and the types of amenities offered at each community. 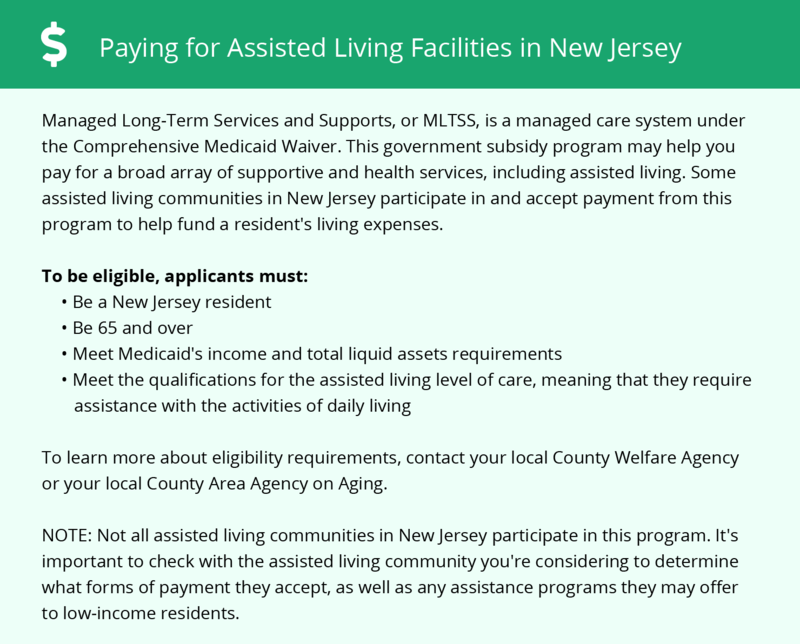 Seniors with Medicaid in New Jersey may be eligible for financial assistance through the Managed Long Term Services and Supports (MLTSS) program. Medicaid is available to seniors who receive Social Security Income (SSI). For people residing in licensed residential health care facilities, SSI provides higher monthly payments. 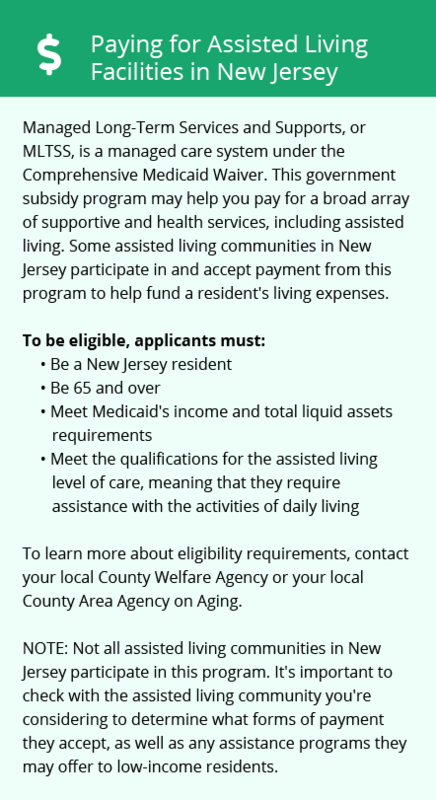 Learn more about these programs, plus who’s eligible, on our Assisted Living in New Jersey page. For more information about different ways to finance assisted living, visit our Assisted Living in New Jersey page. West Orange and the surrounding area are home to numerous government agencies and non-profit organizations offering help for seniors searching for or currently residing in an assisted living community. These organizations can also provide assistance in a number of other eldercare services such as geriatric care management, elder law advice, estate planning, finding home care and health and wellness programs. To see a list of free assisted living resources in West Orange, please visit our Assisted Living in New Jersey page. West Orange-area assisted living communities must adhere to the comprehensive set of state laws and regulations that all assisted living communities in New Jersey are required to follow. Visit our Assisted Living in New Jersey page for more information about these laws.